The reserve enjoys international acclaim for it's work in Rhino conservation, spearheading the successful "Operation Rhino" campaign to bring the White Rhino population back from the brink of extinction in the 1950's and 1960's. This is an ongoing campaign which the reserve is proud to be a part of. The tour includes closed vehicle game drives throughout the day, and you have the option to take an open vehicle game drive at an additional cost, payable direct to the supplier on the day. Lunch is at the award winning Hilltop Camp, which has incredible views over the reserve. The people of Tourism Update made a very good and comprehensive table of the road closures for the 2010 FIFA World Cup’s host cities. Intrepid Travel: 10 tours in Southern and Eastern Africa in June/July 2010 discounted by 20%! Intrepid Travel has currently a nice selection of tours on offer - ten tours in Southern & Eastern Africa in June & July 2010 discounted by 20%! 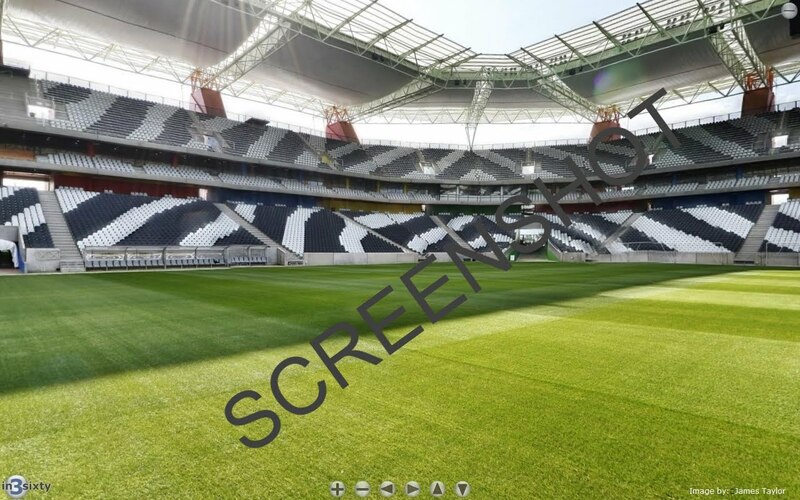 Wow, the people from virtualafrica.co.za made 360° pictures of all 2010 World Cup stadiums in South Africa and are presenting them online on http://worldcupstadiums.in3sixty.com! Kudos for your work! Nice one! I had problems with firefox on worldcupstadiums.in3sixty.com (couldn't see the pics), but it worked perfectly on Google Chrome! Also check the Google Street View Gallery of the 2010 World Cup Stadiums in South Africa. Jerome Valcke of FIFA told the media on the official handover of Cape Town stadium to FIFA that another 164,000 90,000 World Cup tickets are going on sale on Friday (28 May 2010). The 164,000 90,000 tickets are including tickets for every match varying from 200 tickets for the South Africa-France game in Bloemfontein to 2000 tickets for the semifinals. In total there are about 160,000 tickets still available for the public. According to FIFA sales of these tickets will bring the total sold to 98% of the 2.88 million originally available. The new 164,000 90,000 tickets will be sold at the usual outlets in South Africa, and through Fifa's website. So far 96% of the total of 2,88 million purchasable tickets have been sold. Gautrain will start operating on 08 June 2010 and has therefore announced their current fares for the train service linking stations at Sandton, Marlboro, Rhodesfield and the O.R. Tambo International Airport as well as bus routes from Sandton and Rhodesfield stations (map). The “Airport Service” will link Sandton to the O.R. Tambo International Airport. Airport passengers can board at any station and will pay R100 for a single train trip to the airport. All airport trains go via Sandton station. The “Commuter Service” links all the stations with the exception of the airport. A single train trip from Sandton to Marlboro will cost R16.50, from Sandton to Rhodesfield R21.00; and from Marlboro to Rhodesfield R18.50. Integrated single train plus single bus trips will cost R22.50 from Sandton to Marlboro, R27.00 from Sandton to Rhodesfield; and R24.50 from Marlboro to Rhodesfield. Parking at any station will cost R9.50 for the first 24hrs or part thereof as long as you also use the train. If you park and do not use the train, the parking fee is substantially increased. Commuters will access all services by means of a contactless smart card – the Gautrain Gold Card. Cash will not be accepted for passage on the buses or trains or at the parking exit gates. The Gautrain Gold Card allows seamless transfer between Gautrain’s train, bus and parking services. Gautrain Gold Cards will be available at a once-off cost of R10 from ticket offices and ticket vending machines at all stations as well as at selected retailers. Value can then be loaded onto the cards on an as-required basis and the cards can be re-used over and over again to pay for Gautrain services. Passengers also have the opportunity of registering their Gautrain Gold Cards at a ticket office which will enable the blacklisting of a card should it be lost or stolen. Un-used value on the card can then be transferred to a new card. Hostelworld is currently releasing a series of podcasts about South Africa. In the latest episode Hostelworld.com's Colm Hanratty speaks to Wayde Davey of the Apartheid Museum about the history of Apartheid in the country and the museum itself. All flights to and from Cape Town will operate as normal. All flights into and out of London Gatwick and London City airports will operate normally. All flights to and from London City and London Gatwick will continue to operate normally with a full onboard service. Some flights to and from London Heathrow will operate with a slightly simplified onboard service. BA passengers due to fly between 30 May to - 09 June 2010 should make use of the "flight checker" on BA.com to check if their flight is one of the services the airline intends to operate. Lonely Planet's brand new "Africa" guidebook is (12th edition!) is not available in a print guide until July 2010 - but you can download individual chapters early here with Pick & Mix! All individual chapters 30% off - buy 5 or more, download them and save 45%! The Mbombela Local Municipality in Nelspruit, Mpumalanga, has announced its FIFA World Cup transport plan to accommodate the influx of visitors and ease potential traffic congestion. "This system is put forward to ensure that travelling in and around Nelspruit is safe and convenient for residents and visitors," said Mbombela 2010 World Cup coordinator Differ Mogale. "The transport system is an additional service to the regular day-to-day public transport system already in place. It comprises a public transport hub, six park-and-ride points and one park-and-walk point, all with free and secure parking, as well as an airport pickup point. "Shuttle services to the stadium, Fan Fest and public transport hub will be operational from the park-and-ride and airport pickup points," he said. Mogale said 600 branded buses and minibus taxis would provide the shuttle services, with a number of primary and alternative routes that had been developed to ensure the system runs smoothly and traffic congestion is kept to a minimum. "The transport venues will open three hours before the first match of the day and close two hours after the last match of the day. Shuttle services will run every 20 minutes, depending on demand, and will be free from June 11 to 25. Thereafter a nominal fee will be charged," he said. The Mbombela Stadium will not provide public parking for general spectators on match days and entry will be strictly enforced by law enforcement officials. About 650 transport volunteers have received training and will be on hand to assist spectators using the transport system at all the transport venues. "Event-specific signage will be installed throughout the host city to guide the public to dedicated transport venues," said Mogale. He added that print and broadcast media awareness campaigns would be undertaken and detailed pamphlets made available prior to and during the World Cup. Road users passing through Nelspruit, especially the freight industry, have been encouraged to use the N4 ring road detour route, which is fast nearing completion. Road signs will be erected on the N4 to identify the route. Durban is trying to cut the use of private transportation in the 2010 World Cup affected areas to a minimum and has therefore installed a pretty impressive public transport system. The fact that all World Cup attractions in Durban are within walking distance of each other, makes it even more easy not to use your (rental) car. Heart of Durban's 2010 World Cup public transport plan is The Centrum (adjacent to the Workshop Shopping Centre in the city center; see map!). The Centrum will be the hub of the transport system and will be well-managed to ensure the system operates at maximum efficiency and users receive whatever assistance they might need in reaching their next destination. From the Centrum pre-designated Fan-Routes will enable fans to walk to the Moses Mabhida Stadium, or the Fan Fest and beachfront. Please visit Durban's 2010 World Cup website for more info on transport options during the World Cup and/or make use of the specially made Journey Planner, which will calculate for you travel schedules, provide you with timetables fares and important contact information. UPDATE (09 June 2010): The Municipality will operate special shuttle services between the CBD transport hub next to the Workshop complex and several shopping centres (Galleria, Pavilion and Gateway), as well as between the CBD transport hub and the new King Shaka International Airport. 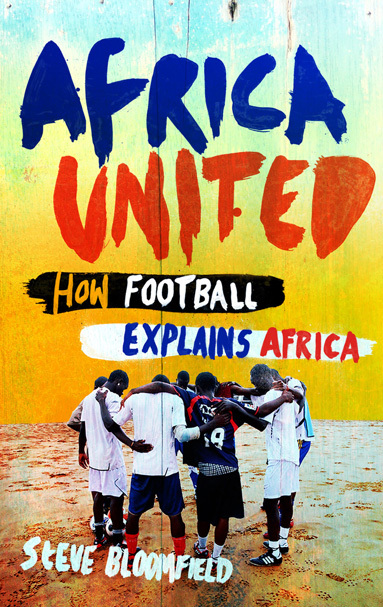 Africa United is the story of modern day Africa told through its football. Travelling across 13 countries, from Cairo to the Cape, Steve Bloomfield meets players and fans, politicians and rebel leaders, discovering the role that football has played in shaping the continent. He recounts how football has helped to prop up an authoritarian regime in Egypt, end a conflict in Ivory Coast, and provide a tiny ray of light in war-torn Somalia. The influence of African football continues to spread rapidly through Europe. Today, no Premiership team is complete without a major African star – Drogba, Essien, Touré, Adebayor, and Kanu. Countless African players are now enriching English football and becoming household names. A recent study by Reed Business Insight has revealed that HostelBookers is, on average, 8.7% cheaper than Hostelworld, and to celebrate, Hostelbookers is giving away some fantastic prizes. A total of 9 people will win one of their great prizes; with 3 winners being announced every week between 26th May and 9th June. The top prize? HostelBookers has partnered with Travelex.co.uk to offer 3 lucky travelers the chance to win a Cash Passport pre-loaded with £1,000 waiting for you to spend. Click here to join the new Hostelbooker travel competition! The competition will run from 00:01 GMT 19th May 2010 and will close at 00:00 GMT 8th June 2010. South Africa: customs, duty free goods, currency restrictions etc. Baggage is cleared at the first airport of entry in South Africa. Exempt: baggage of transit passengers with a destination in Botswana, Lesotho, Namibia or Swaziland, provided the passengers do not leave the transit area. RESIDENTS: local currency (South African Rand-ZAR): ZAR 5,000.00 in S.A. Reserve Banknotes; foreign currencies and traveller's cheques: unlimited, provided declared upon arrival. NON-RESIDENTS: local currency: ZAR 5,000.00 in cash. foreign currencies and traveller's cheques: unlimited, provided declared upon arrival. NON-RESIDENTS: local currency: ZAR 5,000.00 in cash. Foreign currencies and traveller's cheques (also in ZAR): up to the amounts imported and declared and provided departure is within 12 months after entry. Pls see SouthAfrica.info for all visa-related information. Coach football and other sports to local children in underprivileged schools. Double your experience by combining this sports project with teaching in the schools for an all round, varied and exciting experience! The Rainbow Chiefs from drew gardner on Vimeo. · The incredible satisfaction of knowing that you’ve helped deserving children. · New skills, more confidence, a greater understanding of a different culture, invaluable personal and professional development. · And best of all ... an unforgettable experience! The schools we work with are mainly for the poorer children in the local community and they have a love for sports and are very keen and eager to learn. As sports lessons are run in conjunction with ‘life orientation classes’ to encourage self-esteem and leadership along with communication skills, this particular project is not a full time sports coaching project, but part time. However if you use your own initiative to generate sports activity when and where you can or even after school, then we are sure that you will gain so much from this experience, just seeing those happy faces on those enthusiastic children will make it all so worthwhile! Sports in South Africa are becoming compulsory. Unfortunately many children don't receive a proper sports education at their school, which is why your help is needed. You'll also provide essential education for the school teachers, who'll learn from you and be able to carry on with your coaching assignments once you've left, ensuring some continuity for the children. You can coach a variety of sports, such as cricket, football, netball and rugby. Although facilities are basic, there is still a lot that you can do. The average class size is between 15 and 40. As this is not a full time sports project and will therefore not fill up your entire timetable, you will have the opportunity to teach other subjects during the day, such as conversational English or any other subjects you may be interested in. If you would rather coach sports full time then we also have another very exciting option for you based in Knysna. nb. the "Sports coaching volunteering" project is not involved with the "Rainbow Chiefs" in the video. Cape Town's regular transport services (rail, bus, minibus taxi and metered taxi) will extend their operations around match times and will cater for all kinds of transport requirements. The city's main transport hub will be in Hertzog Boulevard outside the Civic Centre in central Cape Town. There will be a transport information kiosk at the transport hub, as well as volunteers to assist visitors. Travelling by private vehicle in affected areas (see map) during the 2010 World Cup period is strongly discouraged due to extensive road closures, traffic exclusion areas, parking restrictions and probable congestion. Please visit the Cape Town's official website for more info on transport options during the World Cup! Eskom, South Africa's electricity public utility, just told the media that the company expects to be under pressure during the 2010 World Cup in the country. According to Fin24.co.za the state-owned utility "will regularly update South Africans on supply during the tournament, which starts June 11, and ask them to turn off some appliances if power runs low". Under worst circumstances Eskom will ask South Africans to turn off everything but one TV and one light. No joke! That's what Fin24.co.za is reporting on their website! Kumuka Worldwide is extending it's popular iPad offer - book a tour with Kumuka in 2010 and pocket an Apple iPad! Simply enter the promotional code IPADEU2 when booking any of the tours listed here! Kumuka iPad Offer is only available for UK residents i.e. customers currently living in the United Kingdom only. The ashcloud is back again. Some aiports in The Netherlands, namely Amsterdam's Schiphol, Rotterdam and Groningen airports, and in England, Northern Ireland and much of Scotland and Wales are currently closed. Dubin in the Rep. of Ireland is also closed. The dutch airports and Dublin are closed till 14.00CET, the London airports Gatwick & Heathrow, as well as Manchester, Liverpool und Leeds, are already open again. Have you ever seen someone playing a guitar like this? Ronnie seems to be a street musician from Botswana (the 5.00 written on the guitar might at least indicate it). His guitar technique is by far the most unconvential I have seen since I saw Hannes Coetzee playing the Teaspoon Slide Guitar the first time! Stunning! Hostelworld.com, together with The Backpack in Cape Town and Johannesburg Backpackers in Johannesburg, is giving away 5 nights accommodation in each Cape Town and Johannesburg to one lucky winner and a friend! 1. How many people are working at the reception desk in The Backpack? 2. How many people are in the swimming pool in Johannesburg Backpackers? Than simply go to Hostelworld.com and type in your answers. How easy is that? The competition is open from Tuesday 11th May 2010 to Sunday 13th June 2010 inclusive and the winner will be chosen randomly on Monday 14th June 2010. Hostelworld is currently releasing a series of podcasts about South Africa. In the latest episode Hostelworld.com's Colm Hanratty took to the streets of Cape Town asking Capetonians about their favourite bars, restaurants and neighbourhoods. Tankwa National Park is offering a fantastic 20% discount on all their accommodation – book now and discover the wonders of this park! This offer is limited for the period 11 May 2010 until 30 June 2010. Tankwa Karoo National Park is situated on the southern boundary of the Northern Cape with the Roggeveld Escarpment in the East, Cederberg in the West, and Klein Roggeveld Mountains in the South. The park is in an easy driving distance from Cape Town (~250km). BeetleCam Project Teaser from Will & Matt Burrard-Lucas on Vimeo. The BeetleCam Project was started by Will & Matt Burrard-Lucas, who had the idea to photograph wildlife from "a new perspective, one that would involve getting close to potentially dangerous animals and photographing them with a wide-angle lens." Therefore they installed a DSLR camera on top of a four-wheel drive remote control buggy, started taking amazing pictures and gave wildlife photography "a new perspective"! Kudos! UPDATE (20 May 2010): Unite the union today (20th May) confirmed that cabin crew would go on strike for five days from Monday May 24, as previously notified. UPDATE (18 May 2010): Britain's High Court has approved British Airways’ injunction against a 20-day walk-put by its cabin crew members. BA said that flights over the next few days will still be disrupted because it is too late to unwind contingency plans already put in place. Visit ba.com for more info! The announcement by Unite, the trade union for British Airways (BA) cabin crew, came after workers overwhelmingly rejected a BA offer aimed at heading off new action. Rebook onto an agreed alternative airline, subject to availability. Cancel your booking and get a refund. All rebooking options will be subject to availability. Pls visit the website of British Airways for more info! 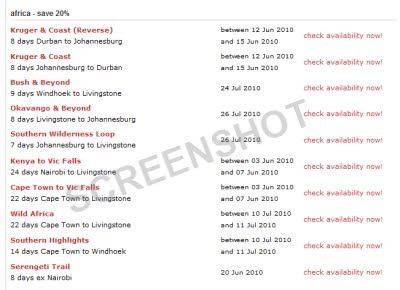 The City of Johannesburg has published a "Joburg 2010 Transport" guide on the city's official webiste.It is basically giving you all information about public transport, park & ride, park & walk and getting in, out and around Joburg. It's a bit of a read, but gives you all relevant info you need to know, such as that you need to book Park-and-Ride/Walk tickets in advance. Otherwise you won't be able to make use of the services. 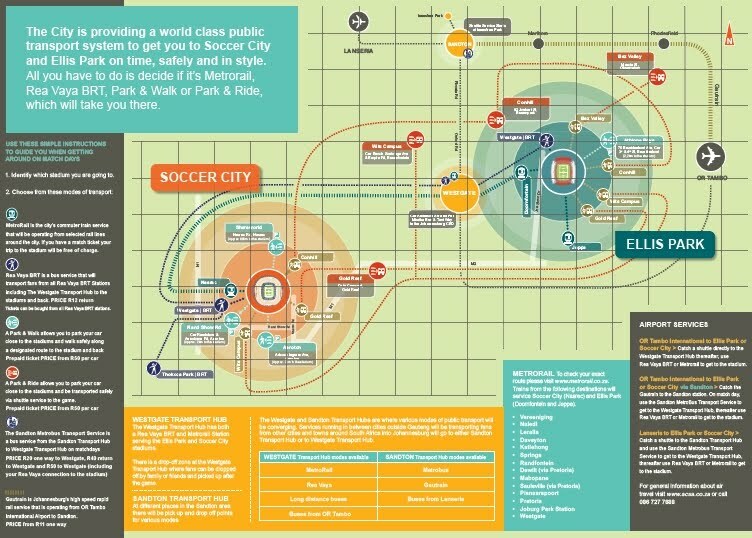 Click here for a map how on "How to get to Ellis Park and Soccer City stadiums". South African sport website www.sport24.co.za is reporting that "an inter-provincial and regional transport system which will facilitate the efficient and safe transport of general spectators to and from matches" was introduced by SA national department of transport. According to the website afleet of 110 new 79-seater buses was acquired for the new service. Knysna to Cape Town, via Wilderness, George and Mossel Bay and from Mossel Bay to Port Elizabeth, via George and Wilderness and vice versa. East London to Port Elizabeth, via King Williams Town and Grahamstown and vice versa. Mozambique's main fibre-optic cable for the communication system in northern Mozambique broke down earlier this week. The actual breakdown has been located north of the town of Vilankulo, in Mozambique's Inhambane province. The cable is on the sea-bed, at a depth of over 30 metres, and can't get repaired by the country's public telecommunications provider TDM. Assistence from outside Mozambique is needed; repairing the fault is expected to take not less than four weeks. More than 230,000 tickets have been sold during the current fifth (and last) ticket sales phase. 270,000 tickets (less than 10% of the total 3 Mio. tickets) are still available from Fifa.com, 11 ticketing centres, 18 selected Shoprite/Checkers and more than 600 FNB branches in South Africa. Johannesburg - which will host the opening and final matches - and Pretoria are sold out but there are still many tickets available for matches in Polokwane, Port Elizabeth and Nelspruit. Host country South Africa is leading the total ticket sales with approximately 1,150,000 tickets purchased by locals. The United States follows with around 130,000, the UK at 97,000, Australia at 43,000, Germany 40,000, Mexico 36,000, Japan 22,000, Brazil 18,000, Canada 17,000 and Switzerland 16,000. Johannesburg - Metrorail will transport match ticket holders of the 2010 FIFA World Cup free of charge on its special dedicated trains to host stadiums. Passenger Rail Agency of South Africa (Prasa) acting boss, Tumisang Kgaboesele, said through its rail division, Prasa will run special commuter services through its Metrorail and Shosholoza Meyl intercity services during the tournament. "We can't wait to play our part in helping South Africa rise to this once-in-a-lifetime occasion. The train services will be available free of charge to 2010 FIFA World Cup ticket holders on special dedicated trains," he said. Kgaboesele said this is an additional special train service over and above the normal services provided, adding that it will be synchronised according to match schedules. "Additional rail services will be scheduled to cope with the demand as government has promised that by 2010 there will be a train available every five minutes during peak times. Train services will be running between 14 and 16 hours every day," he said. Metrorail Gauteng Region will service a total of 12 routes namely Soccer City with 14 train sets, Coca-Cola Park with 13 train sets and Loftus Versfeld with 14 more trains. In order to cope with anticipated high demand on certain parts of the rail network, Kgaboesele said additional train shuttles are also set to run to and from certain routes between stadia. The short routes include Pretoria to Rissik station, Johannesburg to Nasrec station, Westgate to Nasrec station as well as Westgate to Doornfontein station. All stations will start operating from 5am to 10pm on match days while for late games, stations will operate until midnight. Each soccer train will be staffed with a team of ten ticket officers, both to and from venue stations. One inspector or supervisor will be deployed on each soccer train. Shosholoza Meyl, with an active coach fleet of 1 223, already runs on 19 scheduled routes stopping at 95 stations, while Metrorail services 468 stations in Gauteng, Cape Town, Durban and the Eastern Cape. Regional and cross-border train services have been revised to coincide with matches in the various host cities, this includes the scheduling of dedicated trains to matches and from outside the Gauteng region. Passengers will be able to choose between the various products such as the Tourist Class Train Service, Economy Train Service and Premier Class. The train services will run from Musina in Limpopo, Komatipoort, Rustenburg, Durban, Bloemfontein and Greenpoint in Cape Town. Passengers will then connect to Metrorail trains to take them to their respective games. Prasa group chief executive officer, Lucky Montana said they are confident that they are ready to move football fans wherever they need to go well before the 2010 FIFA World Cup's first whistle sounds. 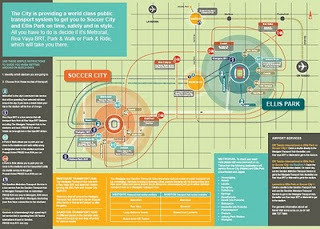 Johannesburg - The City of Johannesburg unveiled a comprehensive transport plan aimed at encouraging local and international soccer fans to use public transport during the upcoming 2010 FIFA World Cup tournament. The City's executive mayor, Amos Masondo, said they were on track and ready to host the World Cup. "The City is ready to welcome all spectators and visitors and we want to encourage everyone to use public transport," he said. Masondo made it clear that no private vehicles would be allowed within the stadium precincts. He said people with valid, official tickets for matches would be admitted to the immediate surrounding areas. "These areas will only be accessible for designated public transport, emergency and VIP vehicles displaying a special permit," he said. According to the plan, Metrorail will be transporting fans to their event and ordinary commuter service. On match days, extra trains will be provided to run from the Westgate Transport Hub to Soccer City. Match ticket holders will board trains free to the games. Metrobuses will run on match days from the Sandton Transport Hub to Westgate Transport Hub. These buses will run every 10 minutes and will stop at various routes while still in the Sandton area to pick up fans. The buses will be picking up fans along the route in the Sandton area. However, there are three fare options for these services, which are R20 one way to the Westgate Transport Hub; R40 return from the Westgate Transport Hub and R50 return to the Westgate Transport Hub including the Rea Vaya ticket. These tickets can be purchased cash on the buses. Sibongile Mazibuko, from the City's 2010 FIFA World Cup unit said the Gautrain will be running from OR Tambo to Sandton station every day. She said fans will be able to catch the easy transport option from the airport to Sandton where they can connect to the Sandton Metrobus Transport Service to Westgate. Mazibuko said the trip from OR Tambo to Sandton with the Gautrain will take 15 minutes. "There will be bus services running from the OR Tambo International to Sandton on a daily basis, as well as from the OR Tambo International to Westgate on match days. "Gautrain will also run services from OR Tambo to Sandton. There will also be a service running from Lanseria Airport to Sandton and back," she said. Johannesburg is the only host city that will provide two match venues, Coca-Cola Park and Soccer City and will also host a total of 15 matches, including the opening and final matches. Masondo said he was looking forward to traveling to the games safely and in style using public transport. Due to the recent Rift Valley Fever outbreak in South Africa the World Health Organisation (WHO) is warning people travelling to South Africa about the risk of contracting the desease. The Rift Valley fever outbreak (Free State, Eastern Cape, Northern Cape, Western Cape, & North West Province) has currently (05 May 2010) infected around 170 people and led to deaths of at least 15 people. WHO is not advising any travel restrictions for South Africa, but it is warning tourists to take precautions. Travellers in South Africa are being advised to avoid contact with raw animal products and to cover up against mosquitoes which may carry the viral disease. The competition starts on the 4th December 2009 and will run until the 11th May 2010, whereafter the winners will be chosen on 14th May 2010. An ostrich's eye is bigger than its brain! The brain of an Ostrich is not only smaller than one of its eyes, but also very small in proportion to the size of the actual bird. Their eyes normaly measure about 5cm and are largest of any land animal. In comparison, the average human eye is about 2.4cm in diameter. Vision is very important in all birds and large eyes allow them to see more of their environment (avoiding predators, searching for prey, flying/running quickly). 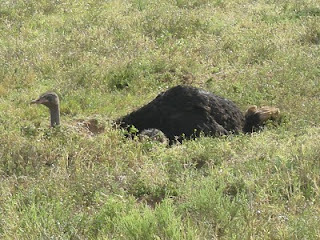 btw - More than 65% of the world’s ostriches are being found in South Africa and South Africa also accounts for 90% of ostrich products in the world. Oudtshoorn in the Western Cape is known to be the "Ostrich Capital of the World".